These pocket sized compasses are a perfect accent to your tactical watch or paracord bracelet. 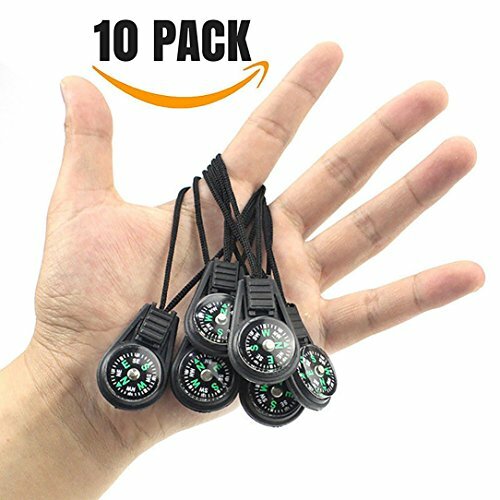 High Quality 10-Pack: so you always have a clear sense of where you're going! Mini Compass for Paracord Bracelet or watch. For camping, hiking, travel, emergency kits or survival. Has rubberized loop for attaching to a watch or Paracord bracelet. You can also hand them out to your group before a hiking expedition so nobody loses their way. ***Please Note: These are magnetic compasses and therefore may not function properly if they are placed close to metallic objects such as: cell phones, metal watches, screws or nails and even high tension power lines can disrupt the magnetic reading. LIFETIME MONEY BACK WARRANTY: If for any reason you are not satisfied with our Mini-Compass set, we will refund your purchase in full; No Questions Asked. Buy with confidence Today! *** New & Improved Model - as appears in the main product images! Strong & Durable: Compass made of high impact plastic. 20mm Liquid Filled Compass for Accurate Readings. Great for Zipper Pulls, or Paracord Tips. Complete Set of 10 Individual Compasses. If you have any questions about this product by ME Superb Deals, contact us by completing and submitting the form below. If you are looking for a specif part number, please include it with your message.